Back in February we released the tutorial ‘How to Hide Content until Someone ‘Likes’ Your Facebook Fan Page’ for FBML Facebook Fan Pages. With how rapidly Facebook changes the way things look and operate, we have been doing the same when designing for Facebook. The February tutorial explains how to use a Fan Gate to reveal specific content only to those who ‘Like’ your FBML page. Since FBML has basically become extinct and will soon be phased out completely the new current method for creating Custom Fan Pages is the Iframe method. Creating a Fan Gate for the Iframe method differs greatly from the old FBML method. In this tutorial we will teach you the correct way to setup a Fan Gate for your Custom Facebook Iframe tab to show and hide content to Fan and Non-Fan users. *PLEASE NOTE: The web is constantly changing and while we are currently using HTML5 on all of our projects not everyone is, for this reason we will still use the HTML that most are familiar with in our tutorials. If you are currently using HTML5, you can easily adapt this tutorial’s code to reflect the new and improved HTML5. Before getting started on this tutorial you should currently already have a Custom Facebook Iframe Tab already set up for your Facebook Fan Page. If you do not already have one set up, complete our previous two tutorials ‘How to Set Up a Facebook Application for your Custom IFrame Tab’ and ‘How to Create a Custom Facebook IFrame Tab’. After completing these two tutorials you should have a fully functioning Facebook Iframe Tab and your code should look like the code below, which will be the basis for this tutorial. You will need to change two items in the code, insert your Iframe tabs specific ‘APP ID’ and ‘APP SECRET’, these can be found by visiting your Facebook developer page. Also make sure that the path to the facebook.php file is correct. The first variable, $signed_request, simply checks whether or not the user who is visiting your Fan Page is actually signed into Facebook. The second variable, $like_status, takes the first variable and uses it to find out whether or not the signed in user has ‘Liked’ your Facebook Fan Page. This is a very basic conditional statement; it simply states if the user has ‘Liked’ the page do this, otherwise do this instead. The content under ‘if ($like_status)’ is revealed to viewers that have become a fan of your page. 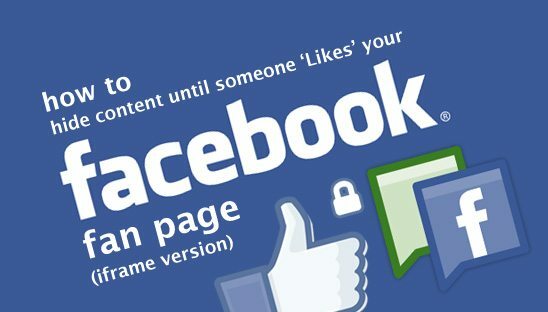 If viewers have not become a fan of your page, then they will see the content under ‘else’. You should now have a fully functioning Fan Gate on your Custom Facebook Iframe Tab. When using a FanGate on your Facebook Iframe Tab, it is best to have the ‘Like’ button readily available within the design. This way your viewers do not have to scroll upward to find the ‘Like’ button. Thankfully, Facebook provides simple coding to add a ‘Like’ button to any website. Click Here to view one of our pages in action.